You'll be £6.00 closer to your next £10.00 credit when you purchase Kent at War 1939 to 1945. What's this? Following on from Blitz on Kent, all aspects of life during the Second World War were experienced during in this embattled county. From the onset of the war Kent became a key part in the front line defence of Britain. Defences were built, and the Home Guard formed. With the threat of invasion receding, the county took part in the great offensive against Nazi Germany. Preparations and training took place that lead to the D-Day invasion in June 1944 and ultimate victory in 1945. This book will tell the story of the story of the County from the very beginning of the war to the end and afterwards, both from civil and military perspectives. Subjects covered are: Invasion defences, Home Guard, Dunkirk, life during wartime, D-Day, German Prisoners of War, the Americans in Kent, The Royal Navy, people and life during wartime, The RAF, soldiers in Kent – regiments, training, individual studies, the military on the move: Bren Carriers, Churchill tanks, Covenanter tanks, artillery, Matilda tanks, Valentine tanks, motor bikes, lorries, lease-lend Vehicles, weapons, women in wartime Kent, VE Day and post-war Kent – the legacy of the war. The range and selection of pictures is excellent, making for a fascinating account of life in this, the garden county of England, and also home to Hell's Corner, being as it was on the flightpath of the German bombing runs into England/London. Highly recommended. A useful and entertaining book. A really enjoyable little book. The book 'Images of War, Kent at War, 1939-1945' is an absorbing collection of rare photographs of military training in rural Kent and the naval dockyards at Chatham. Not only a book for those of a 'certain age but a useful addition to the students reading the history of the Second World War. When reading 'Images of Kent' one must remember at the time many of the photographs were taken Britain was only months away from being invaded, and Kent was to be the battlefield. Britain had insufficient resources to stop the German invaders. Names were being chipped off mile stones and sign posts taken down to confuse the invaders. The Home guard was being formed and recruits were asked to bring their own weapons and secretly auxiliary 'stay behind' groups were also enlisted in Kent to attack German units after regular troops had retreated. War was real but for some, a bit like that iconic TV series 'Dad's Army'. The photographs are reproduced from the original photographic glass plate found on a rubbish tip and now form part of the War and Peace Collection Photo Achieve. Contains a fascinating collection of more than 150 original images from the period, many taken in Maidstone and its surrounding villages, giving a unique insight into wartime life in Kent. 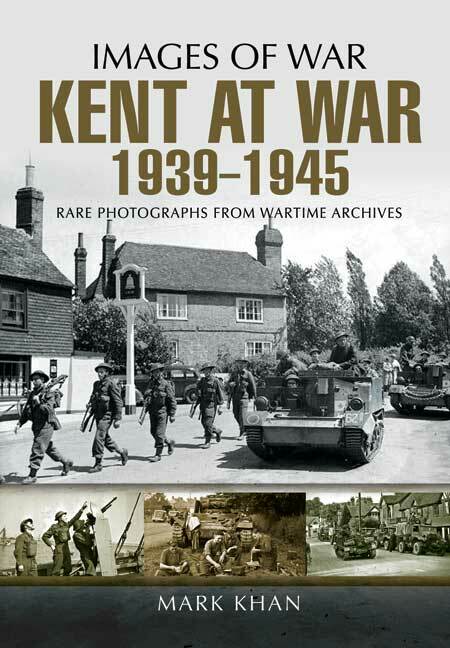 This fascinating book features over 150 rare photographs of Kent taken during the Second World War. The images portray many different aspects of life in wartime Kent from both military and civilian perspectives. It is a fitting tribute to the important role the county played in the Allied war effort and the immense bravery of its residents. The book is divided into 10 chapters, covering The Early Years, The Kent Home Guard, Life During Wartime, Soldiers in Kent, Military Vehicles in Kent, VIP Visitors to Kent in Wartime, The War at Sea, Women at War in Kent, D-Day and Kent and finally, the End of the War. Each one has an interesting section of text to outline the stories, then a selection of appropriate photos, all informatively captioned. Though I was born after the war, I spent my youth living on the Kent and Sussex border, going to school in Tunbridge Wells, a town which features in a number of the wartime pictures. I am familiar with many of the smaller villages around the county, such as Goudhurst which also features in a number of pictures. Seeing them and recognizing the surroundings helped put some extra context to it all for me. As seen in the Kent & Sussex Courier. The photographs reproduced here represent many facets of life in Kent during the Second World War and provide a fascinating snapshot of a variety of subjects, including civilian life, the Kent Home Guard, soldiers and military vehicles, the war at sea and the role of women at war in the country. It will interest those who study local wartime history as well as military vehicle enthusiasts, re-enactors, military modellers, and those interested in the Home Front. As seen in the Folkestone and Hythe Express. As seen in the Kentish Express. As seen in Kent on Sunday. As seen in the Dover Express.